Two prominent avenues, one outstanding neighborhood restaurant. 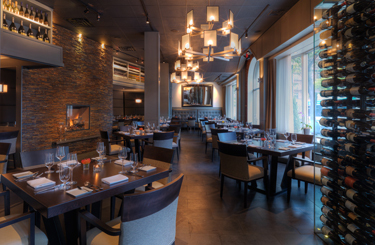 Located in Boston's historic Back Bay at the corner of Commonwealth and Massachusetts Avenues, Deuxave is the answer to a neighborhood restaurant, a place where patrons from near and far will truly feel at home and want to frequent again and again. Executive Chef Christopher Coombs' inspiration behind the American nouveau cuisine is seasonality with a focus on working with the finest farms and purveyors, sourcing out the freshest, local ingredients and amplifying their magnificence. The cuisine is strongly rooted in the nouvelle techniques of contemporary French cuisine, married with the splendor of American ingredients in a refined but casual setting. General Manager/Sommelier Jason Irving is one of Boston's youngest and most respected wine enthusiasts. Irving has worked to create an extensive wine program that has become a local favorite - patrons are sure to relish in Irving's passion for the art of pairing wine and food.